What a terrific start to my weekend! 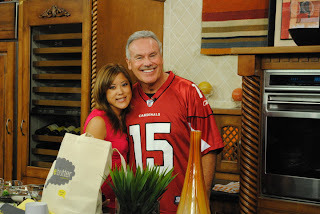 I headed out to Phoenix on Thursday for my appearances on Friday morning. It was still 100+ degrees...and though there were moments that it felt SUPER hot...I have to admit...I LOVE LOVE LOVE the heat!! I love it when it's so warm at night and I don't have to put on a jacket and it just feels so good on my skin and in my bones. I am definitely a hot weather girl. First up, Good Morning Arizona with Tara Hitchcock. This is Arizona's number 1 rated morning show on Channel 3! Tara was so much fun and so easy to talk to! 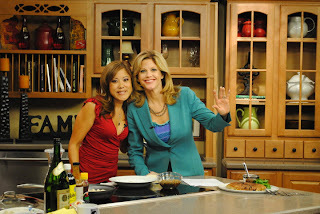 Loved being on the show with her and sharing my potsticker recipe with her. This is the recipe I created for my Williams Sonoma Demo and I wanted to share how easy potstickers can be! This is one of my all time favorite foods, it's something that always reminds me of my mom and I love making them! This is a labor of love and it is always worth it for me to make these especially when I see the smiles on everyone's faces when they eat it. As soon as we were done with my segment on Good Morning Arizona, we zipped over to ABC Channel 15 for my cooking segment on Sonoran Living! I got to show Craig Fouhy how to make a simple and deliciously spicy Green Chili and Chorizo Frittata! I wanted to make something with a Mexican flair in honor of my business partner Anna who is from Phoenix. I also wanted to highlight the fresh chorizo that people can get from local purveyors like Schreiner's Fine Sausage. Craig was hilarious and I felt so bad that he couldn't really eat it because he's lactose intolerant! One of the cool things about being at ABC was that we got to see Anna's cousin Sandra who has been working there for years! And I got to meet a fan!! Randy! She was so cute and I just loved how adorable she was! So happy that Annie was there with me!! 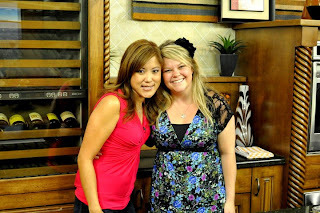 She's the best business partner and friend in the world! More fun in Phoenix at Hula's Modern Tiki! But I will make another post for that!! Special Thanks to Jan Stevens, Susan Hacker and Tony Felice for their hard work and support!! Redmond Business Solutions and Tony Felice PR and Marketing. Set aside potsticker wrappers in refrigerator. To prepare the filling for your potstickers, julienne and finely dice the Napa cabbage, place in a large bowl, add 3 tsp of salt and mix thoroughly. Allow this to sit for 5 minutes, then gently squeeze the cabbage to remove excess water. Transfer the cabbage to another large bowl, add the ground beef, minced green onions, and combine thoroughly with remaining ingredients. Cover with plastic wrap and place in refrigerator for approximately 10-15 minutes to allow the flavors to develop. Keep refrigerated until you are ready to assemble the potstickers. Fold a wet paper towel on a plate and place a wrapper on the towel to moisten the skin. Put the wrapper in your hand dry side down, place one teaspoon of the potsticker filling in the center. Bring both sides up to form a half moon and use your index finger and thumb to seal the center border only. Create two pleats along each side , the complete by sealing the border tightly. In a medium non-stick pan, heat 2 Tbs of vegetable oil over medium high heat. Place potstickers side-by-side in a circular-pattern, filling the pan from the edge to the center. Add enough water to cover about ¾the height of the potstickers. Cover with a lid and reduce heat to medium. Cook until the water is completely evaporated and the bottom of the potstickers are a golden brown. Plate and serve with accompanying dipping sauce. To prepare the garlic cilantro dipping sauce, combine all the ingredients in a bowl. Mix thoroughly, cover and allow the sauce to sit for about 10-15 minutes. Transfer to individual dipping cups for serving. Recipe makes approximately 90-100 potstickers (can be made ahead, keep frozen until you are ready to cook them). Preheat broiler. Melt butter and heat oil in heavy broiler proof 10-inch-diameter nonstick skillet over medium heat. Sauté onions and chorizo in heavy large skillet over medium-low heat, sauté for about 5 minutes, add green chilies and green onions, season to taste, cook another 5-7 minutes. If there is a large amount of oil, pour off excess oil and leave approximately 2-3 Tbsp in pan. Whisk eggs, add milk, 1 teaspoon salt, and 1/2 teaspoon pepper in medium bowl, add 1 1/2 cups hot pepper Monterey Jack cheese and combine. Add egg mixture to skillet; fold gently to combine. Cook until almost set. Sprinkle remaining 1/4 cup hot pepper Monterey Jack cheese over the top and extra chopped green onions on top. Broil until frittata is puffed and cheese begins to turn golden, about 3 minutes. Those potstickers are heavenly. I'm still craving them! And thanks SO much for the love to Redmond Business Solutions, Doreen. It was fantastic having you here in Phoenix, and it appears that Phoenix has fallen in love with you!! #1 viewed video on azfamily.com. NICE! You have been awesome! Thank you and Anna and I had a blast with you guys! So excited to come back again....hopefully soon! And I'm so happy that Phoenix loved the video on AZFamily.com!! !